The Festival Rencontres & Racines (Meetings & Roots) may show you that “difference” is a chance and nothing else. Organized every year, the festival is the best way to discover cultures from all over the world. From America to Africa and through Asia, Rencontres & Racines has a great particularity. Let’s explain of what the festival consists. 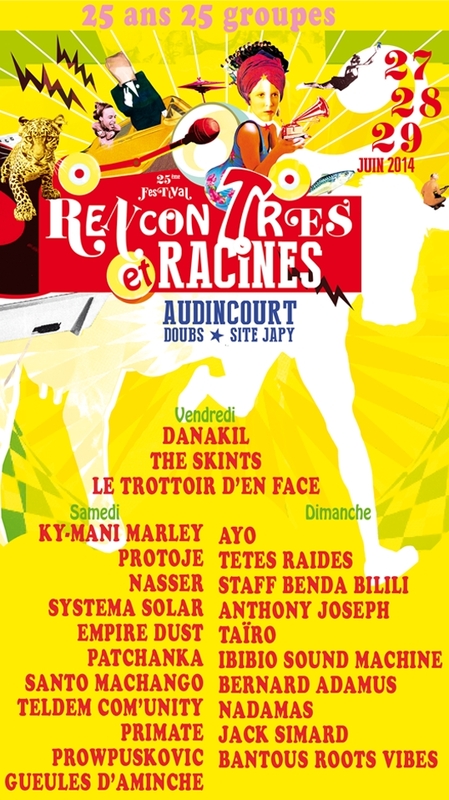 Rencontres & Racines is settled every year in France at Audincourt since 90’s. The city of Audincourt is well-known for its various origins and for its foreign population. Rencontres et Racines becomes the most important festival of eastern France because of the important worth it raises: solidarity, respect, tolerance. Music is a great opportunity to defend a message or just to decompress with friends. Our festival invites every year big headlining of music (all culture confused). That’s why nearly 37 000 people are waiting for them every year. Rencontres & Racines isn’t only a festival of music. It is also a place where human associations (80 in 2013) can explain their goal and earn money for their investments. 70 stands of those Charities were offered in 2013 to the public: their culinary speciality, drinks, memories of the country they defend, or just a warm welcoming smile. Those things provide money which they may use for their human project.